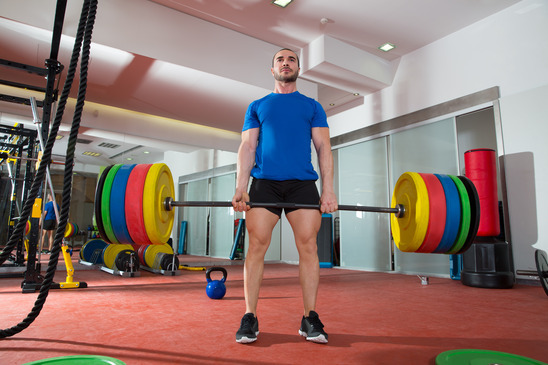 When it comes to productive exercises, it simply can’t be denied that the deadlift is arguably one of the most productive and beneficial exercises that a gym-goer could ever wish for. The deadlift can be performed using either a barbell, or dumbbells, and can also be performed in a whole variety of different variations. There’s the stiff-legged deadlift, which is designed to work your legs, particularly the hamstrings. There’s the sumo deadlift, which requires a person to take a wider grip and stance than usual, and then there’s the standard deadlift of course, which works the back, the legs, the shoulders, and even a few other minor muscle groups too. The deadlift is the ultimate exercise that can improve strength, grip strength, physique, flexibility, and endurance, and it’s also one of the most dangerous exercises if performed incorrectly. This is an exercise that isn’t to be taken lightly. If you happen to suffer from any back related pain or injuries, then you should stay clear of deadlifts, even if you only go light. If you currently enjoy a clean bill of health however, and you’d like to master this popular and effective exercise, then here’s what you’ll need to do. Pay close attention, form is CRITCAL with this exercise, you get your form wrong and you could end up seriously injured, it really is that serious. 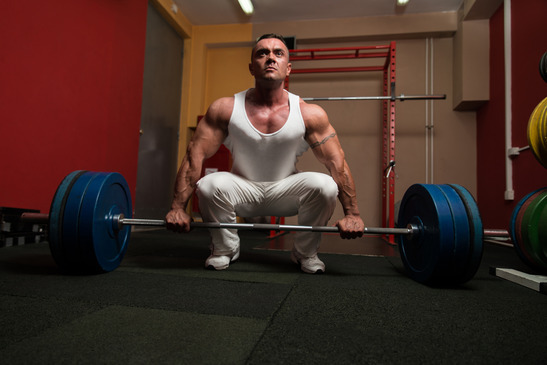 Here we’ll take a look at the barbell deadlift variation as it’s the most common. To begin a deadlift, always start with the barbell on the floor, never on the safety pins in a squat rack, as that would be a rack pull, which is a different exercise altogether. Stand in front of a barbell loaded up with the weight you’ll be lifting, and position it so that your feet are actually underneath the bar. Making sure to keep your back as straight as you possibly can, bend at the knees, bend forward slightly, and grab the bar using a shoulder width overhand grip. We do not recommend trying the one hand over, one hand under grip, commonly referred to as the suicide grip, as this is a recipe for a torn bicep for beginners. Making sure you have a firm grip on the barbell, begin the lift by pushing with your legs, whilst getting your torso into an upright position simultaneously as you exhale. Make sure to keep the barbell as close to your shins as possible, without actually touching them of course. Be sure to not be bending at your back! When you’re in the upright position, and the bar is off the ground, push out your chest and bring your shoulder blades back so that the back is contracted. Always keep your head up and never look down at the ground as this can result in a serious neck injury. Once your arms are almost fully locked out and your back is contracted, that is considered a ‘good lift’. Bend the knees and slightly lean forwards (keeping your back straight!) with your torso from the waist, ensuring you keep your back straight, and slowly lower the bar down towards the ground, keeping your head up (facing forwards) as you do. Once the bar touches the ground, you can then repeat for the necessary required amount of repetitions in exactly the same way. Never bounce the weight from the floor. That was how to do the standard barbell variation of the deadlift. As mentioned previously, the exercise can also be performed using dumbbells, in exactly the same way, except you’ll have a dumbbell in each hand as opposed to gripping a bar. Take a look at this video for a visual example and explanation of what to do with a dumbbell deadlift. you know when the day before was deadlift day… your legs don’t work as well as they should the day after doing these!